When it comes to finding great fried chicken, don’t wing it.Go to one of these places. The spot Bavette’s Bar and Boeuf, 218 W Kinzie St (312-624-8154). There’s a not-so-secret star at this Near North steakhouse: chicken. Why it’s clucking awesome Served with buttermilk ranch and Louisiana’s Crystal Hot Sauce, this tender organic chicken isn’t quite the steal that KFC is, but the six pieces come with a crispy, flaky breading so well executed they have a leg up on Colonel Sanders’ version. 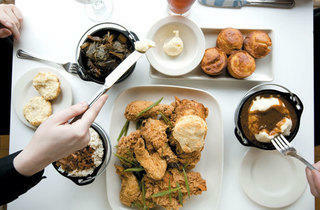 This homey Andersonville restaurant delivers reliable Southern fare. What to order A Boarding House Lunch (features fried chicken), $16 (available 11am–3pm, Monday–Friday). 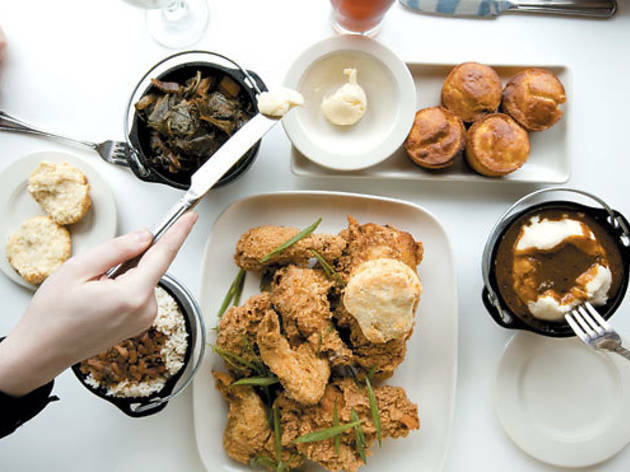 Why it’s clucking awesome Many Chicagoans have dubbed this the best fried chicken north of the Mason-Dixon line, and they just might be right. With a crunchy, perfectly seasoned exterior and juicy interior, it’s derived from an old Edna Lewis (“the Grand Dame of Southern Cooking”) recipe. The XXL lunch comes with three sides and dessert. This Lakeview hole-in-the-wallis the place for Korean-style chicken. What to order Seoul Sassy wings, half, $8.95; whole, $15.95. Why it’s clucking awesome Lightly battered and slathered in sesame-soy glaze (“Don’t call it teriyaki!”), these flavorful, subtly sweet fried chicken wings are based on an oh-so-sassy family recipe. Formerly Edna’s, this East Garfield Park soul-food spot is the stuff of legend. Why it’s clucking awesome Crunchy, substantial coating gives way to break-apart chicken seasoned with a subtle blend of spices. Classic, delicious and worth the (considerably long) wait. Also try The biscuits. They come with the fried chicken dinner but should not be ignored.